I hope everyone enjoyed the Thanksgiving Holiday - I sure did. The Black Friday shopping tradition lived on. My mother, sister, friend Beth + I shopped from 4:30am to 1:30pm. Needless to say, it was a long morning/afternoon, but it was a blast. I think I am still recovering. Here is a peek at one of my weekend looks. 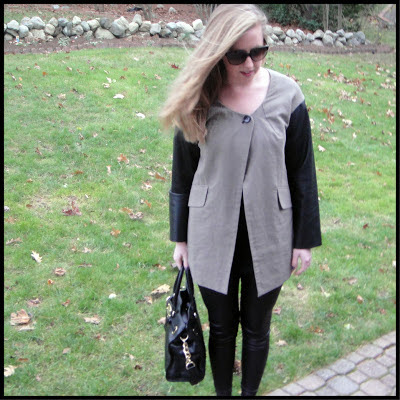 Remember this leather sleeved jacket (first seen here)?? 1 comment on "Leather Laden"